Bees have been living with the mysterious Colony Collapse Disorder for a decade. Ten years after the initial alarm, what is the current status of the world’s bee populations, and how far have we come towards understanding what has happened? Since the alarm was first raised, many countries have created new monitoring methods to judge the status of their bee stocks. As a result we have much more data on bee populations, although coverage is still patchy and differences in survey methods make it hard to compare between continents. It is clear that bees in the United States are still struggling. Beekeepers can tolerate up to 15% losses of colonies over winter, but the US is massively above this threshold, having lost 28.1% of colonies over the 2015-16 winter. Canada, by contrast, reported 16.8% losses. This is better, but still above the level of losses at which beekeepers can easily restock. Only recently have we had data from central Europe. There, honey bees seem to be doing better: 11.9% losses in 2015-16. Meanwhile, in New Zealand surveys only began in the last year and have reported winter loss of 10.7%. 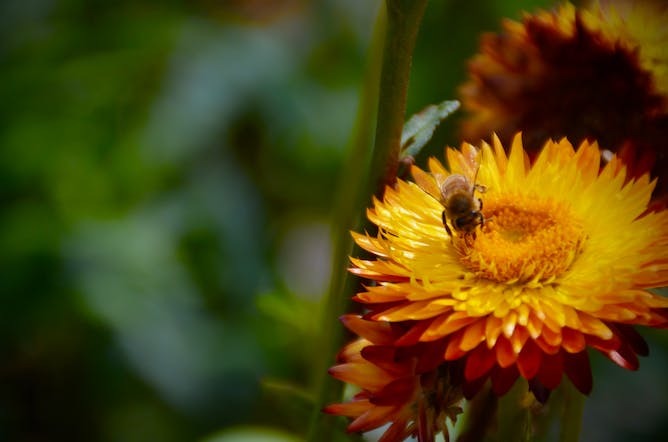 Australia does not yet have a countrywide survey of the state of bee colonies. Fortunes are mixed for bees around the world. Honey bees are not the only bees that we should care about: wild bees are vital pollinators too. 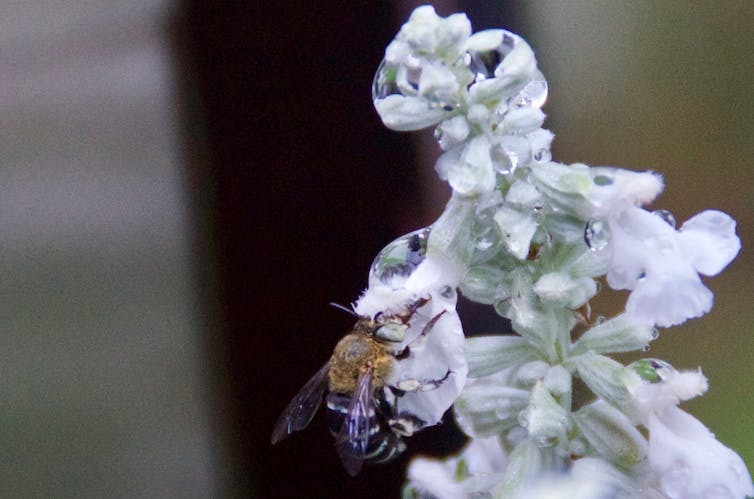 Some plants are pollinated by only one wild bee species, such as the macropis bees that forage on the loosetrife plant. Unsurprisingly, we have much less data on wild bees than honey bees, and those data we do have point to bigger concerns. For our wild bees we only really have good data for populations that are endangered or that have completely disappeared. Between 2008 and 2013, wild bee diversity in the US dropped by 23%, and a previously common bumblebee species was recently listed as endangered. The good news is that the past decade has seen plenty of progress in understanding the mystery of Colony Collapse Disorder. The bad news is that we now recognise it as a complex problem with many causes, although that doesn’t mean it is unsolvable. For all bees, foraging on flowers is a hard life. It is energetically and cognitively demanding; bees have to travel large distances to collect pollen and nectar from sometimes hard-to-find flowers, and return it all to the nest. To do this they need finely tuned senses, spatial awareness, learning and memory. Anything that damages such skills can make bees struggle to find food, or even get lost while trying to forage. A bee that cannot find food and make it home again is as good as dead. Because of this, bee populations are very vulnerable to what we call “sublethal stressors” – factors that don’t kill the bees directly but can hamper their behaviour. For solitary species such as the blue-banded bee, difficulty foraging can be a very serious problem. 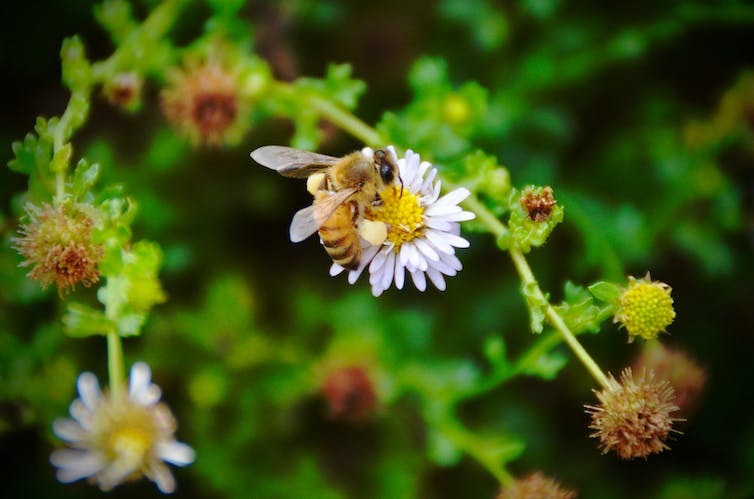 In a recently published review, we argue that modern agriculture and industry have created a host of sublethal stressors that damage bees’ cognition. For example, diesel fumes and neonicotinoid pesticides both reduce bees’ foraging efficiency by disturbing chemical communications in their brains. Modern intensive agriculture disturbs bee nutrition, which impairs their brain. Climate change interferes with the relationship between bees and the plants on which they feed. In addition, managed honey bees are afflicted by a range of pests, viruses and predators that have been spread around the world as a side-effect of international trade. The worst is the ominously named Varroa destructor mite, which causes brain development disorders. At the global level, to preserve our bees we have to improve the environments in which they collect food. Every small action can make a difference. Planting flower borders with bee-friendly flowers in your garden can provide food for both wild and domestic bees. You can reduce or eliminate the use of herbicides or pesticides when gardening. Even mowing the lawn less often can help bees out. You could install a native bee hive or insect hotel. Another tempting option is to buy local honey, which often has a more distinctive flavour than mass-produced versions. In Australia, we are fortunate in that our bees seem to be doing better than many other parts of the world. The Varroa mite has not yet invaded our shores, and in many areas bees can access pesticide-free bushland (although unlike Europe, Australia has not yet banned use of neonicotinoids in agriculture). Australia also has an incredibly rich diversity of wild native bees: up to 1,600 different species, including our emblematic stingless bees. Even so, to protect this diversity we need better surveys of how these species are doing. Ten years on from the alarm over disappearing bees, it is fair to say we now know the nature of the problem and what can be done to fix it. It’s up to us to take the steps needed to sustain these precious pollinators of our food for the future.